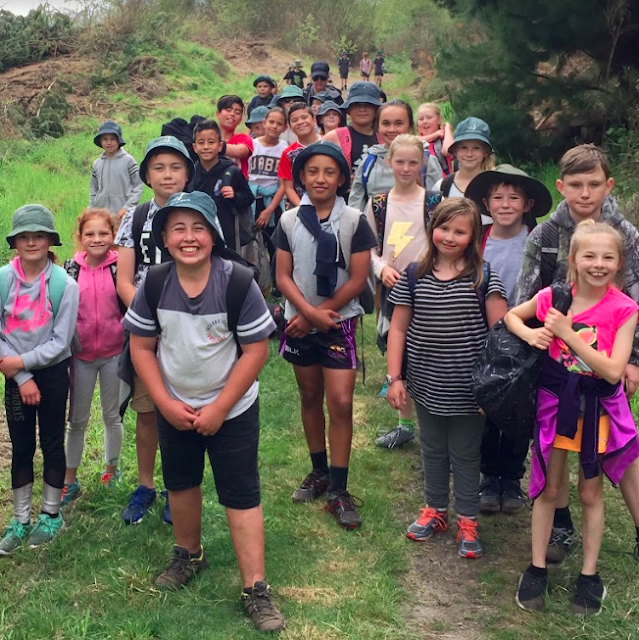 This is a story of our Koru camp at Woodend last week. It has been created by taking excerpts from individual camp stories that students wrote for their personal blogs. We hope this gives a number of perspectives and reactions from a few of our points of view. See our individual blogs for more from specific children. Last week on the 24th of October Koru 1 and Koru 2 went to Woodend Camp. We went there to have fun and for new experiences we did lots of activities. First we went on the bus to Pegasus park for lunch. Then after lunch we walked throw Pegasus Pines. When I was walking I felt like I’ve been walking for years. When we were walking I saw a snail and Rylie wanted to keep it! Finally when we got to Woodend park we had a snack and played on the playground for a while. After, we walked all the way to Woodend Camp. When we got arrived Cody told us the camp rules. We then we got into are groups. I was with Jaycee, Rylie, Alizay, Savannah, Angel, Paige, Willow b, Kiara, Mia, Ana and are parent was Vikki. Cody also told us what we can do like the Aero jump, water slide and the flying fox. I did all of those things and I saw people playing this game so I joined in. It’s called GaGa Dodgeball. So I played it until the bell rang. The bell is when it has been rang that you have to go into your groups and get ready for the next transition. After nachos dinner we went to our cabins we were cabin 3. We got into our pjs because we were having supper. We had cookies and a hot drink then we got our camp journals and wrote what we did that day including our highlights and challenges. We also had a circle time to share about our day. After our Camp journals we had to go to our cabins and went to sleep at 9.30pm. We kept on talking till bedtime. In the morning I had a shower and got ready for the day. After I got ready I tidied up my stuff and got back into bed. When everyone woke up I played cards with Charnz, Wyatt, Yossi and Lachlan. We played cards until it was time for breakfast. For breakfast I had 1 piece of toast, 2 bowls of cornflakes and 1 bowl of porridge. Along with a few cups of water. On my toast I had margarine and jam. When breakfast had finished and the people cleaning had finished cleaning, we lined up on the courts to get ready for our rotations. My group received Air Rifles and Archery. As in my group, I mean group 3 which is my bunk room and a girl bunk room in one group. When we got sent to go to our station, we waited like 10 minutes before our leaders came. When our leaders came they were holding an Air Rifle each and a box of ammo each. When it my turn to fire the rifle the leader showed me how to aim and fire. The scope was a zoom in one but it got blurry for me so I missed all 3 shots I got. My friend Ryder hit the duck twice. We then did archery. Sadly we only got 4 people to have a go. We had two lines with two bows. My friend Ryder hit the blue and white which is real good. But he also missed a shot. I got two misses and one yellow which is very poor. The bell rang again for lunch. We then went to the hall for lunch we had yummy burgers in the burgers I had meat paddy’s, cheese, tomatoes, and beetroot. They were so good. After that we went back to the activities. We went to air rifles and I was really good at it because I got two ducks out three which is really good. But there was one problem... that was that it was super cold and raining so hard. Orienteering was so fun because I was with all my friends we went in the forest we got lost once but we found our way out. It was raining so hard everything was drenched! For dinner we had roast chicken, mashed potatoes, cooked carrot and peas and corn! It was really really delicious. The next few parts of camp were my favourite, when everybody had finished dinner we moved on to supper. Everybody was allowed 2 biscuits and a milo. I had two hundreds and thousands biscuits and while we were drinking our milo and eating biscuits we went into circle time. So it was in groups like Koru 1 year 5s with Mrs Harris, Koru 1 year 6s with Mr K and so on with Koru 2. We talked about our favourite parts of the day, mine were going on the flying fox. When we finished circle time in the main hall, my favourite part had come! the Woodend Camp Talent Show! First was Jett with his magic, flying apples and card trick. I rated his magic a 8/10. A few talents later came my favourite, Helena and Willow W were doing a comedy act! First they started with Willow brushing Helena’s teeth, or should I say face?. And the last bit they did was when they chose 2 people from the audience who were Lucas and Jason (Tyler's dad). They blind folded Jason and Lucas just shut his eyes. When they both couldn't see they told them to open their mouths, and squeezed the lemons into their mouths. I was laughing so so so so bad I started crying laughter! When everybody finished people were aloud to go up the front and do a dance move then get one of the parent helpers to try and copy it. When all the cheering and screaming was over and done with it was time to go to bed. When we go to our bunkroom, me and my friends went to brush our teeth then headed back over. When everybody from Koru 1 and Koru 2 were in bed the lights were turned off. On day 3 for breakfast we had the same thing and again we had to go to the activity's one by one. The activity that we did was the team building and that was fun. The thing I like about team building is that it needed us to work as a team because sometimes I like going solo in things. Then we went to go karts and that was so cool. I didn't crash so I felt good of myself. It was scary at first because it went really fast. Then we started packing up to go back home and I love the bus drive. I learnt how to be a better leader and a lot of different skills like how to drive a go kart and other stuff. I felt so happy to be back from camp but at camp I felt super joyful and excited. My first goal is to always manage myself and be organised I achieved this goal I have got my friend and cabin mate Milla for the proof “she had all her thing tidy put in the right place”. The second goal I had was to show I care for the environment and to listen to the camp instructors, I achieved this goal because I was always where people told me to be and I didn’t break any of the plants. Really loved camp and hope to go to camp again. I thought camp was a great place, I felt lucky to have my parents come, it was a shame it rained on the thursday. I challenged myself by going on the trampoline. My camp goals were to respect and listen to the teachers and staff members at camp, and to give everything a go when we do stuff at camp. Also I have evidence that I achieved my goals by asking the staff and some of the teachers and they said that I had achieved both of my goals and that was great. I learnt that I should work as a team more because I needed more support instead of working by myself in maths and other hard challenges for me. Also I learnt some new skills like leadership, and kindness. At camp I felt courageous, caring, connected, creative, curious, and excited because it was a bit new to me and I felt so happy to get a chocolate with my desert because Mr K thought I had a great camp journal and that was so great. Thank you Mandy for helping to put this together!